Paragliding is a relatively new adventure sport in Nepal, and little information is available in tourist guidebooks. Paragliding in this Himalayan country can be a truly wonderful and fulfilling experience for the adventure-seekers. You can experience unparalleled scenic grandeur as you share airspace with Himalayan griffin vultures, eagles, kites, while floating over villages, monasteries, temples, lakes and jungles, with a fantastic view of the majestic Himalayas. The past years have seen the activity flourish in Pokhara, and it now is an internationally recognised destination for free-flight enthusiasts. The Himalaya is made up of a series of lesser mountains increasing in size, before the greater Himalaya, with its majestic snow-clad peaks, dominate the sky. The range that is now offered for paragliding is the Mahabharat range, south of these giants. 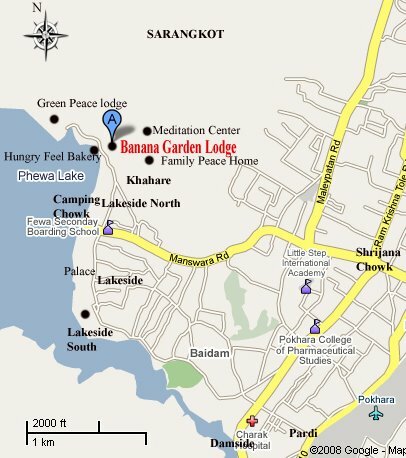 Most flights are out of Pokhara, the beautiful lakeside town at the foot of the Annapurna Himal. There are various deals for the paragliding enthusiast as well as those checking this sport out for the first time. There is a three-day introductory course for beginners, as well as tandem flights (where you can fly with ah instructor) for the inexperienced or less brave. at 6000ft, you sit back in your seat as your qualified pilot takes you on an unforgettable journey. The take-off point for these flights is Sarangkot (1592m), which offers prime views of Phewa Tal and the mountains at sunrise and sunset (provided the skies are clear); the landing is by the lake. Alternatively, the experiences gliders can strike a package deal. After a few introductory flights, you could take off on a six-day para-trek to the incredibly beautiful west. While on the paratrek, the flyers will be lodges or camped in villages, with local guides helping with equipments or in cooking.